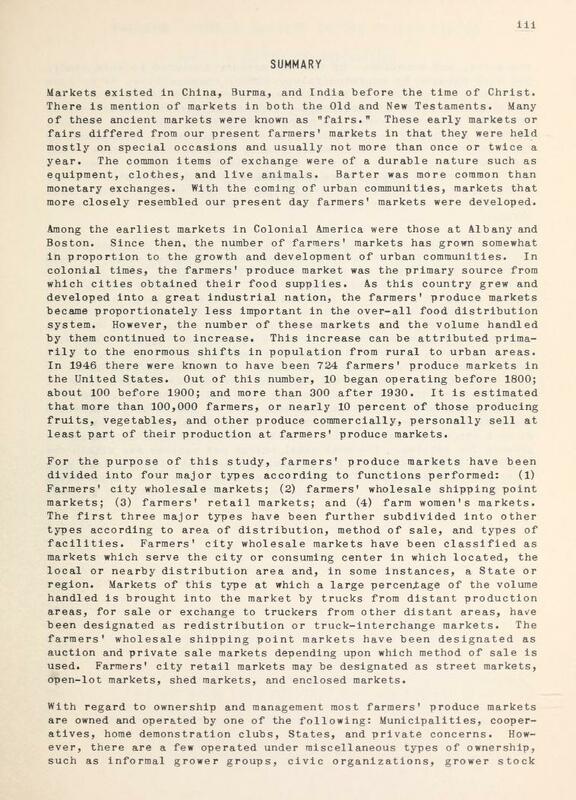 *For the purpose of this publication, a "farmers' produce market" is a market place where farmers do their own selling of produce from their farms. 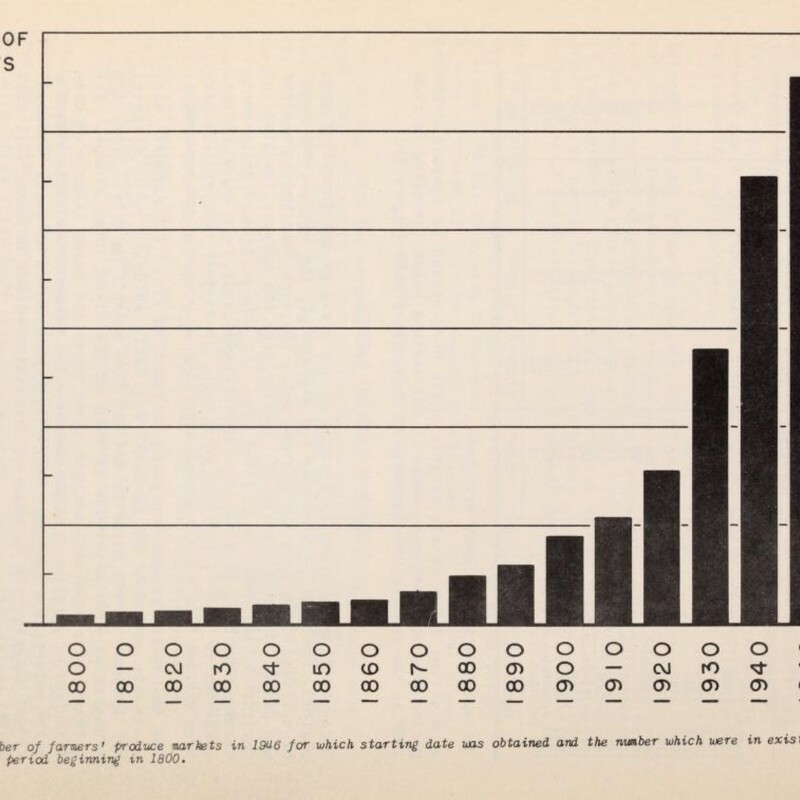 Originally it was planned to cover a wide range of marketing problems. 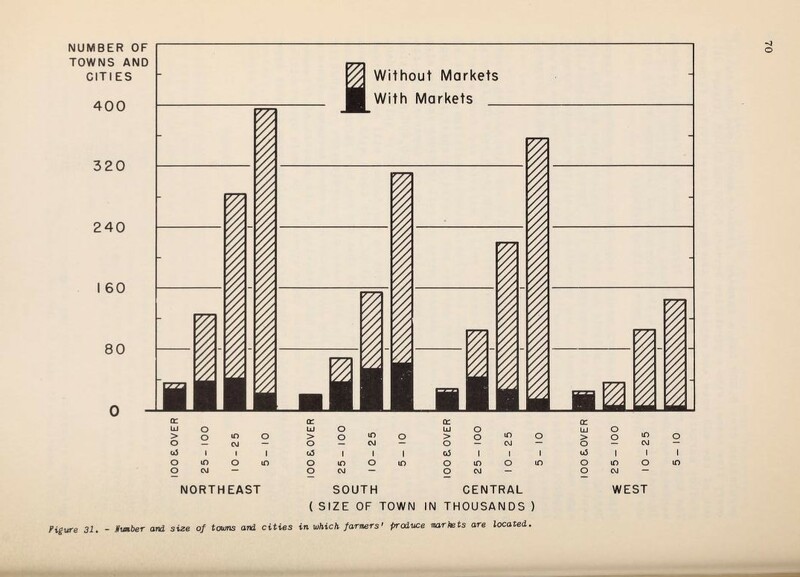 Later it was discovered that many of these problems, such as the best type of market for a given locality, the most desirable type of ownership and management for a given market, and factors determining success, are subjects that justify individual treatment. 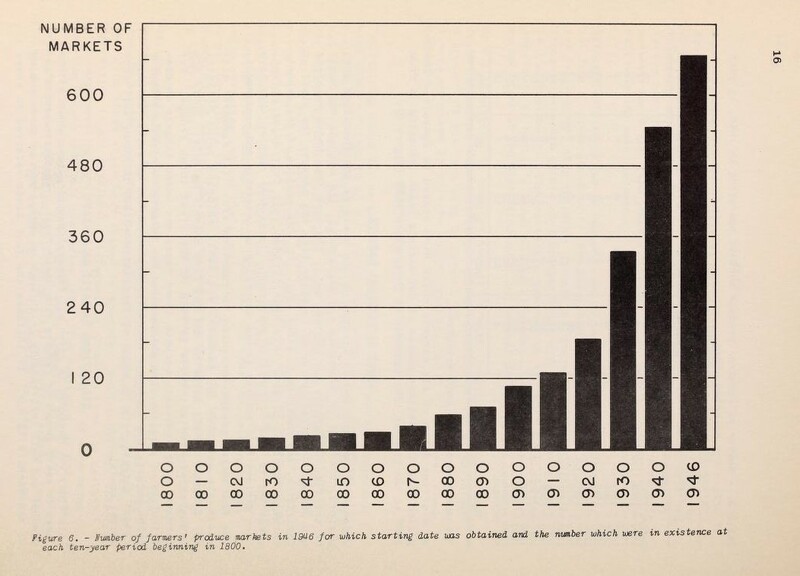 Therefore, a series of reports has been planned. 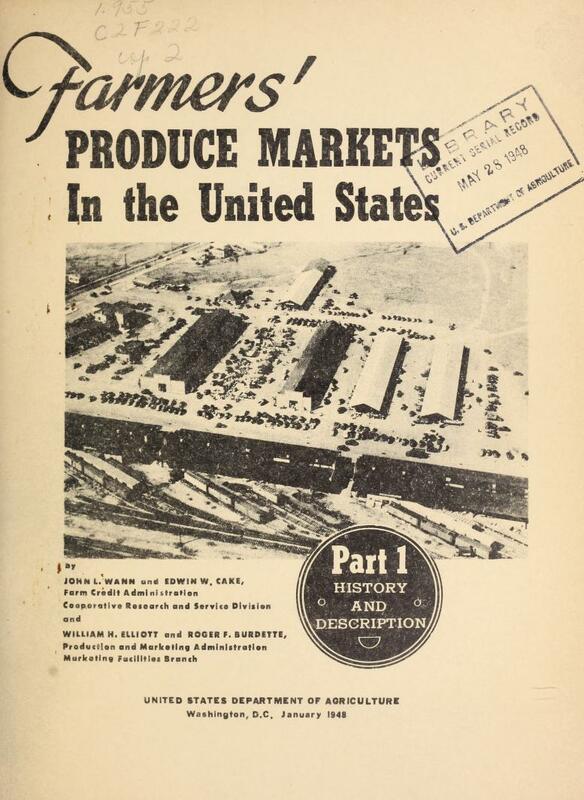 This report is the first in the series and covers the history and description of farmers' produce markets in the United States. 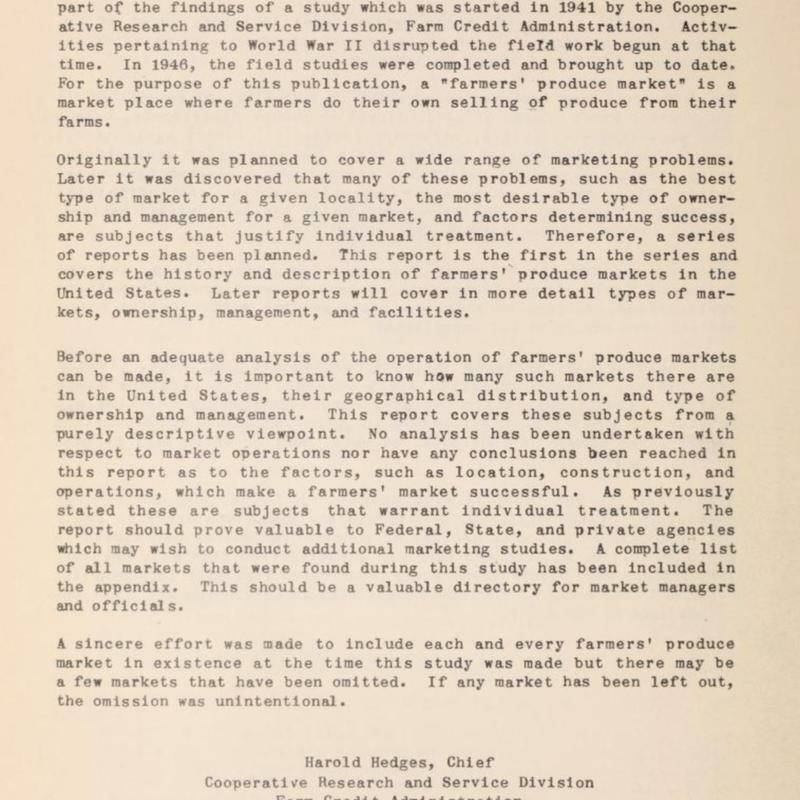 Later reports will cover in more detail types of markets, ownership, management, and facilities. 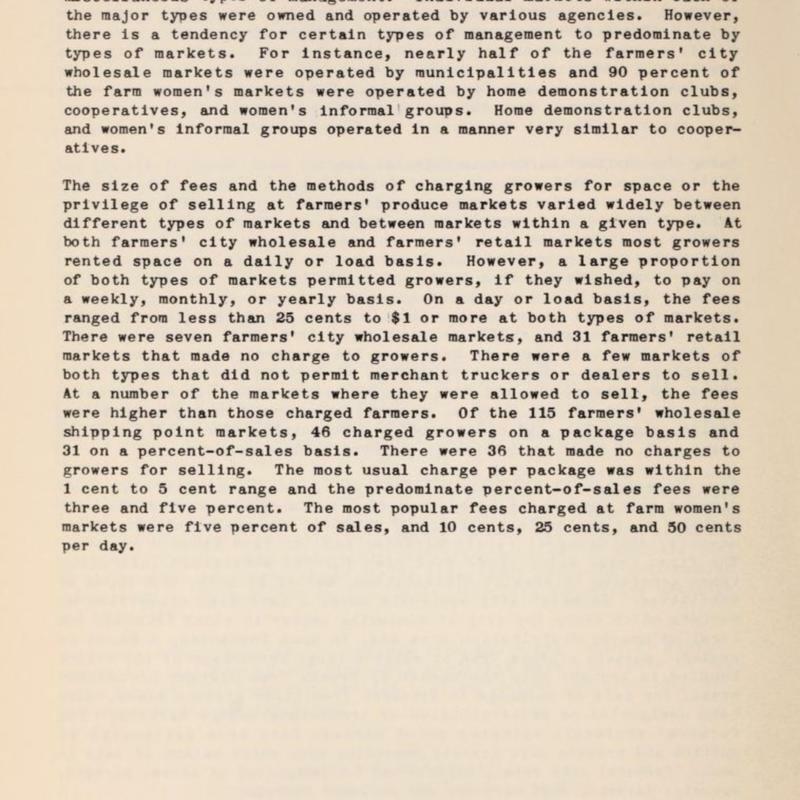 Before an adequate analysis of the operation of farmers' produce markets can be made, it is important to know how many such markets there are in the United States, their geographical distribution, and type of ownership and management. 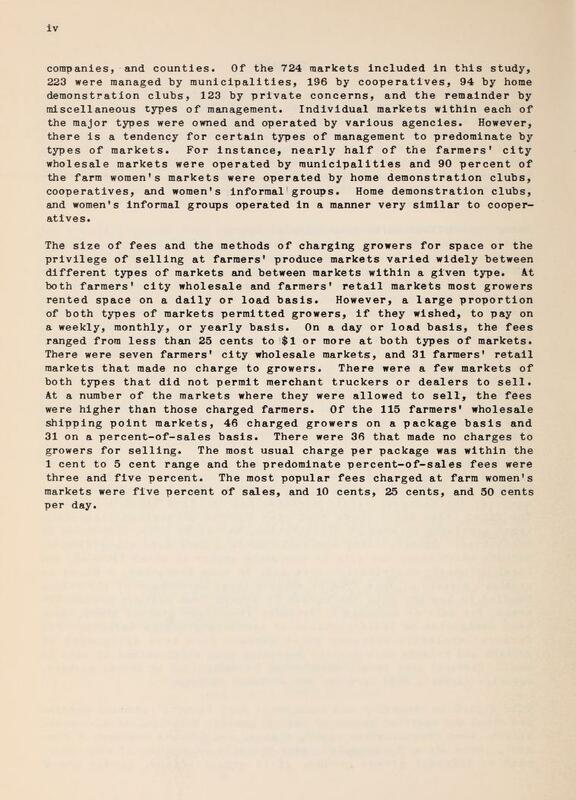 This report covers these subjects from a purely descriptive viewpoint. 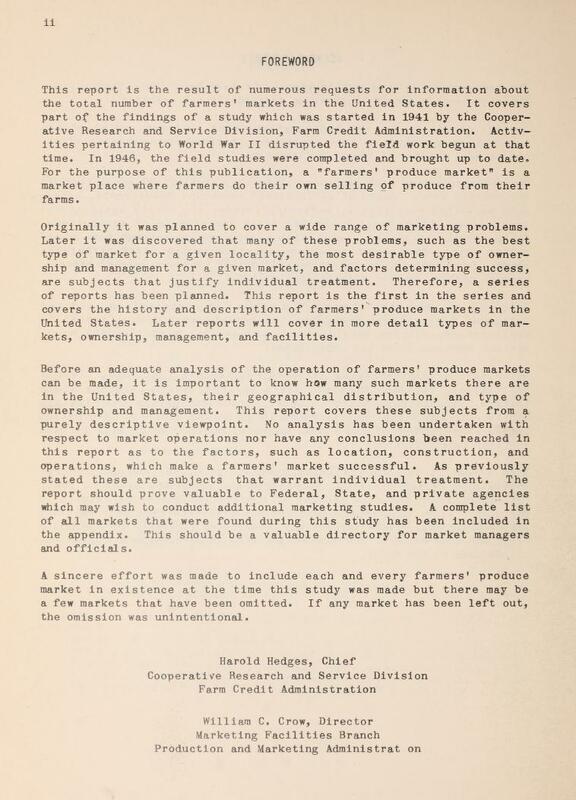 No analysis has been undertaken with respect to market operations nor have any conclusions been reached in this report as to the factors, such as location, construction, and operations, which make a farmers' market successful. As previously stated these are subjects that warrant individual treatment. The report should prove valuable to Federal, State, and private agencies which may wish to conduct additional marketing studies. 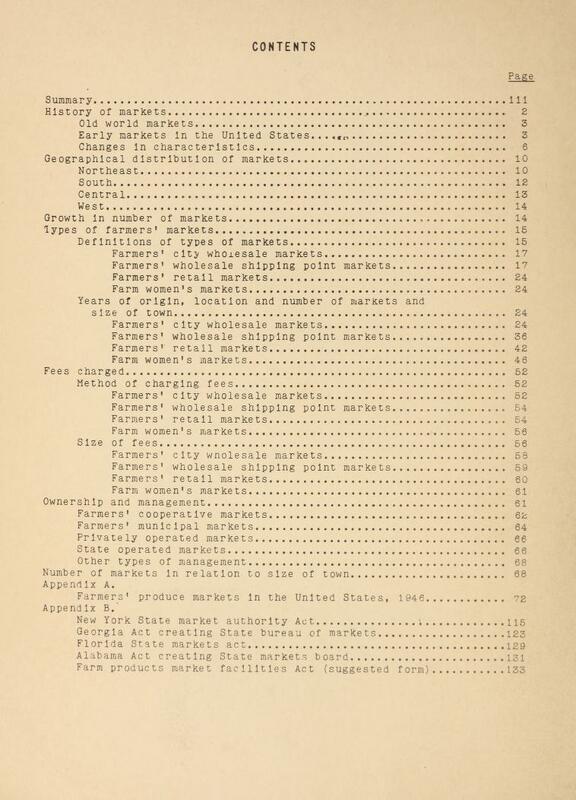 A complete list of all markets that were found during this study has been included in the appendix. 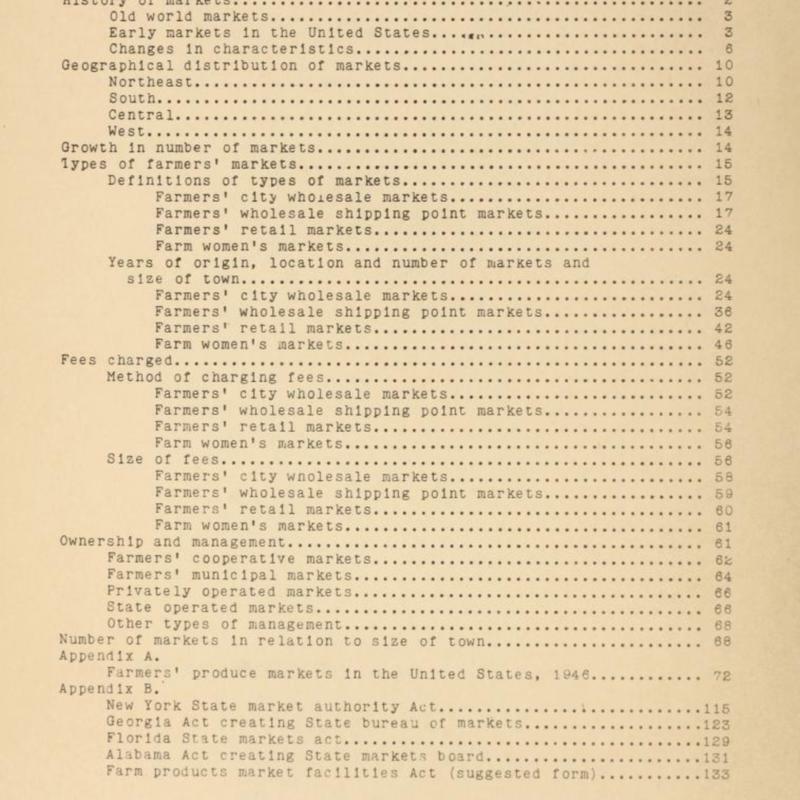 This should be a valuable directory for market managers and officials. 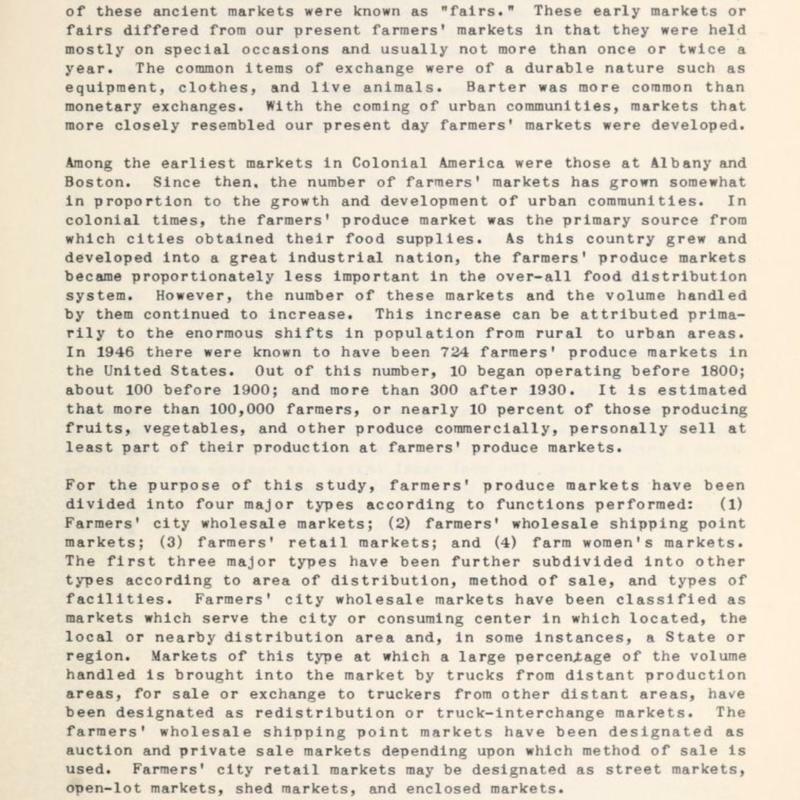 A sincere effort was made to include each and every farmers' produce market in existence at the time this study was made but there may be a few markets that have been omitted. 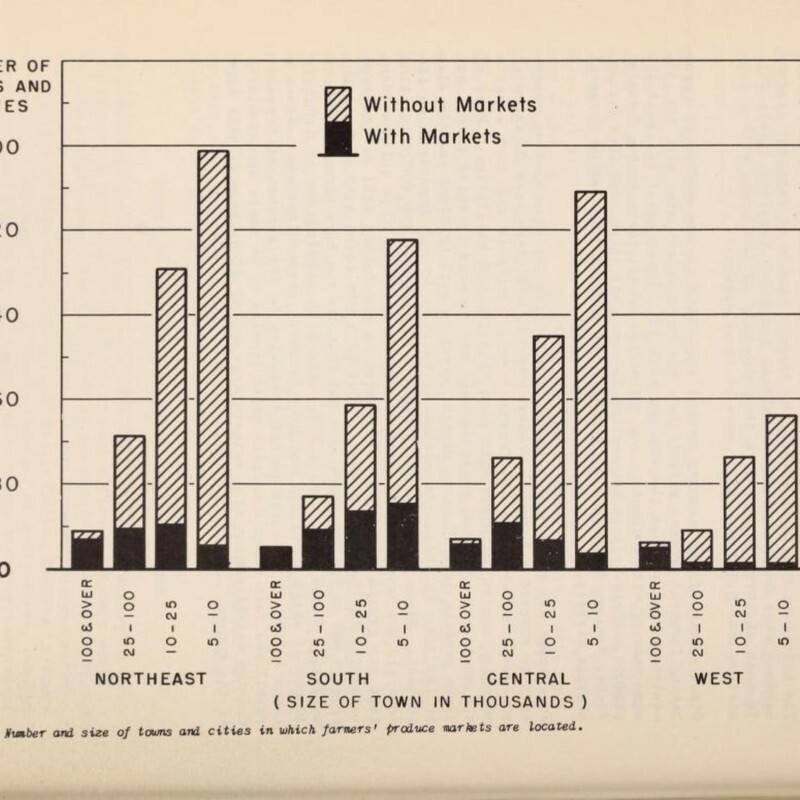 If any market has been left out, the omission was unintentional.